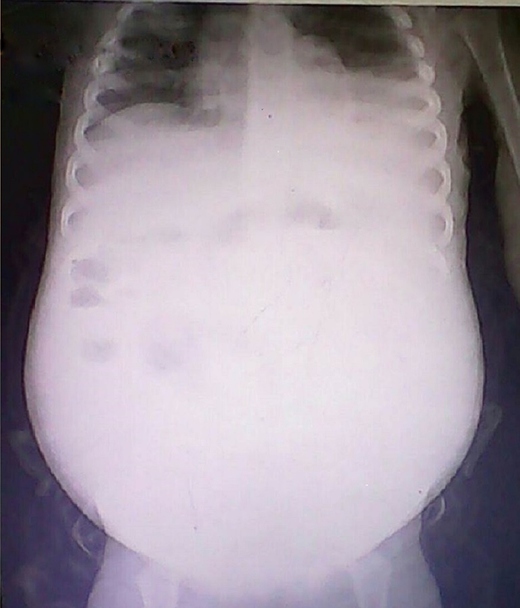 A 4-year-old male patient presented to our hospital with the complaint of progressive abdominal distention and growth retardation which began at the age of one. He referred to several doctors without being able to give the right diagnosis. There was no history of fever, cough, or contact with TB patients. He had received his regular vaccines. There was bacillus Calmette Guerin (BCG) on his left shoulder. Abdomen was extremely distended. Shifting dullness and fluid wave were present. We could not evaluate organomegaly because of ascites. His other systems were normal. Urinalysis showed calcium oxalate (++). Culture and sensitivity were normal. Peripheral blood smear was normal. Chest and plain abdominal films showed left pleural effusion, diffuse abdominal haziness, elevation of the diaphragm, bulging of the flanks and fluid accumulation. Tuberculin skin test (TST) was negative. Abdominal ultrasound showed massive amount of fluid in the abdomen, left pleural effusion (750 mL), deposits within kidney caliculi, portal vein, supraliver veins and liver artery were normal. 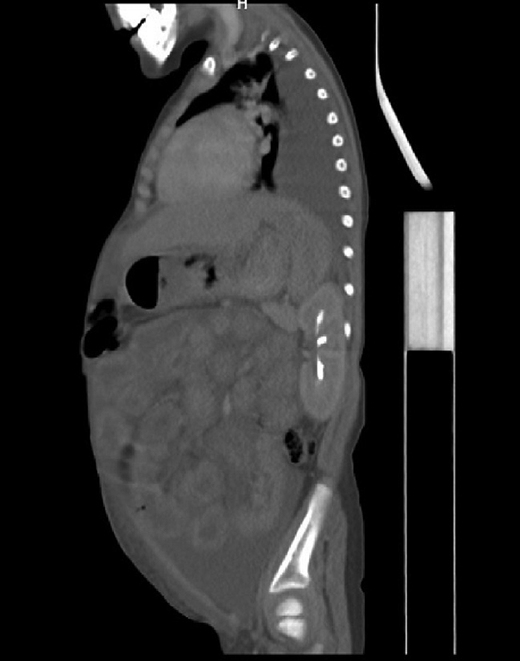 Contrast enhanced computed tomography of the chest and abdomen revealed evidence of moderate left pleural effusion, massive fluid accumulation in peritoneal cavities and medullary nephrocalcinosis signs. Work up for cause of medullary nephrocalcinosis including the serum calcium 7.3 mg/dL (low), serum phosphorus 3.7 mg/dL, 25-hydroxyvitamin D 4.9 ng/mL (low), parathyroid hormone (PTH) was normal, arterial blood gas test was normal and a 24-h urine accumulation was as follows: total size 750 mL, protein 85 mg, creatinine 22 mg, calcium 300 mg. A 24-h urinary excretion of calcium was 15.7 mg/kg (more than 4 mg/kg) indicating a hypercalciuria. For control of ascites, the patient was initiated on medium chain triglyceride (MCT-based diet). Antitubercular therapy was started with regimen containing isoniazid, rifampin, ethambutol and pyrazinamide for two months followed by isoniazid and rifampin for 4 months. Abdominal distention and ascites fluid resolved gradually with time. Abdominal ultrasound after 2 weeks revealed resolution of ascites. He had started on hydrochlorothiazide for hypercalciuria. He responded well to the treatment and hypercalciuria was resolved. His physical examination and general condition were stable after he finished antituberculosis therapy. Laboratory evaluation was normal and has been uptill now.